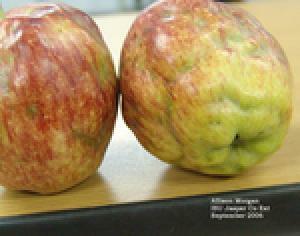 Apple maggot is the major pest of homegrown apples in Iowa. Nearly 100% of the fruit from an untended apple tree will be damaged. Even trees that receive good care may have 50% or more damaged fruit. Apple maggot control is very challenging in the urban setting where untended trees and alternate hosts abound. Apple maggot damage, most noticed at harvest time, appears as knobby, mis-shapened fruit with small pits or blemishes on the outer fruit surface and brown, discolored streaks running through the flesh on the inside. A nickname for the apple maggot is "railroad worm" because of the slender brown streaks in the fruit flesh. The apple maggot is a fly in the group commonly known as the fruit flies. In addition to apples, the apple maggot will attack cherries, plums, crabapples and pears. Female apple maggot flies insert eggs beneath the skin of the fruit from about mid-June until shortly before harvest. The puncture causes small holes that later appear as blemishes on the fruit. If the eggs hatch the resulting larvae tunnel through the fruit flesh, leaving the brown tunnels behind. Grown maggots drop from the fruit and enter the soil to pupate. There is only one generation per year. Heavily infested fruit drop prematurely from the tree while other fruit may remain on the tree until ripe. There is no cure for apple maggots already inside apples. Controls must prevent damage by stopping the flies before they lay their eggs. One possible management option is to remove infested fruit from the area to reduce the number of flies in the following summer. Unfortunately, even picking up fallen fruit twice a week may not adequately reduce apple maggot populations because of migration from other, nearby apple trees and alternate hosts. Apple maggot traps, available from garden catalogs and stores, are red spheres or yellow cards coated with a sticky substance. Flies attracted to these devices are trapped with the hope of eliminating them before they have a chance to damage the apples. Research has indicated that the high number of 1 trap for every 100 fruits on the tree may provide satisfactory levels of control. Insecticide sprays are the traditional way of controlling apple maggots in commercial orchards. Three or more sprays of a long-residual insecticide are needed to prevent apple maggot damage and produce the perfect-looking fruit that consumers expect. Homeowners can use insecticide sprays such as Sevin, esfenvalerate or “home orchard spray” from mid-June through September. However, variations in rainfall, application thoroughness and interval between sprays often lead to substantial apple maggot damage despite spraying. Why are some of the fruit on my summer squash misshapen?